Simplified Design of V/F Converters shows how to design and experiment with V/F converters, both voltage-to-frequency and frequency-to-voltage. The design approach here is the same one used in all of John Lenk's best-selling books on simplified and practical design. Throughout the book, design problems start with guidelines for selecting all components on a trial-value basis, assuming a specific design goal and set of conditions. Then, using the guideline values in experimental circuits, the desired results are produced by varying the experimental component values, if needed. If you are a working engineer responsible for designing VFCs, or selecting IC converters, the variety of circuit configurations described here should simplify your task. 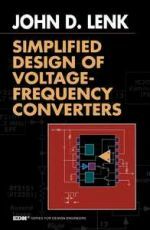 Not only does the book describe converter-circuit designs, but it also covers the most popular forms of VFC ICs available. Throughout the book, you will find a wealth of information on VFC ICs and related components, including how to test and troubleshoot completed circuits.